Well, we went back on the bridge walking trail after a bit of a hiatus--alright, a long hiatus. But my wife and I are still ticking. 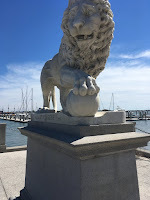 This time it was to trek to a beautiful bridge, the Bridge of Lions, which connects the downtown of St. Augustine, Florida with Anastasia Island. We didn't find the Fountain of Youth, but I'll say that walking on the scenic bridge did make me feel just a tad younger. It was definitely worth the walk on a beautiful March day. 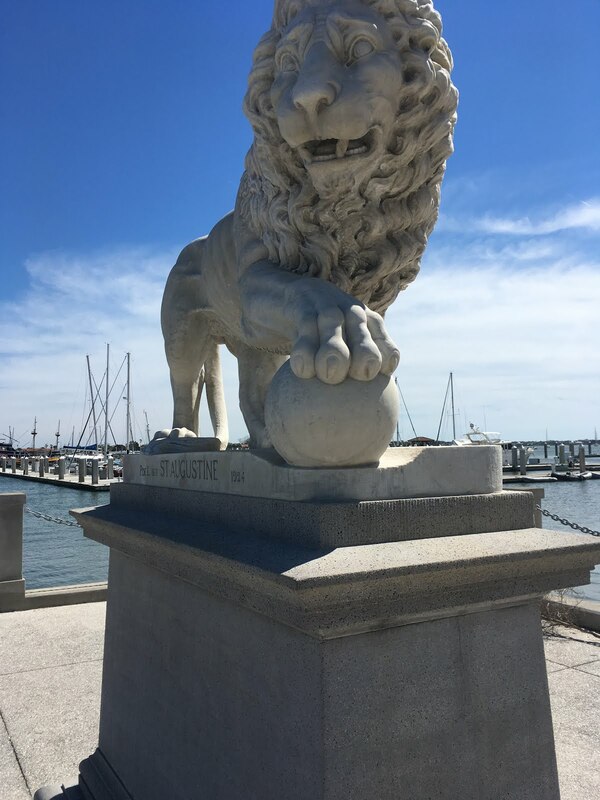 Impressive indeed were the namesake pair of marble lions that guard the St. Augustine side. We even had our choice of sidewalks on either side of the bridge. The pictures here do not do the bridge justice. 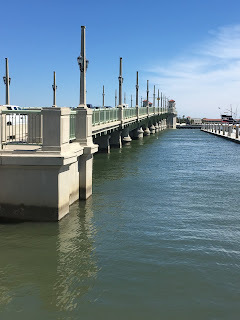 The Bridge of Lions is a surprisingly long third of a mile or so in length, crossing the Matanzas River (a part of the Intracoastal Waterway) and just a stone's throw (or maybe a very long tee shot) away from the Atlantic Ocean. The bridge is not high, registering about 25 feet above the water according to the definitive source of Wikipedia (and judging by my keen sense of height, that seems about right). And the sidewalk railings were comfortably solid and high. Not a scary walk, and complete with a lovely view of boats, water, and landscape below. After walking on it, we took the drive back to our hotel on Anastasia Island and, to my surprise, it was a drawbridge (in this case, officially a double-leaf bascule bridge). The middle span rose just as I, at the wheel, reached the gates about to come down. Yes, I should have known. Fortunately, if you can walk across a bridge, not only can you drive across it, but you can also apparently stay suspended on it for at least a few minutes while the middle goes slowly up, and then slowly down. We took video (what else to do? ), but it was not very exciting (and not included here). Here's a little history of the bridge: The original bridge, complete with lions of course, opened at the site in 1927. It lasted a good 79 years before needing replacement. A temporary bridge was constructed alongside to carry traffic for a few years, and the original bridge was significantly reconstructed. I think it qualifies as a new bridge at the same location, opening in 2010, and the lions were reunited with the new bridge a year later. In sum, it is a very impressive, non-scary bridge. Sigh. I've been quiet lately on the bridge trek front. It's been hard to get excited after walking then driving across the Golden Gate Bridge late last year. But I've got to note last week's accident on the Chesapeake Bay Bridge, where a driver and her car, following a collision with a truck, got thrown over the bridge and then down 27 feet to the water, which apparently was 10 feet deep at that point. Fortunately, the amazingly resourceful driver survived by crawling out of her car and swimming to the surface and then to some rocks. Several days after the accident, the media coverage continues. Yesterday there was a front-page article in the Washington Post entitled "Long before crash, drive on Bay Bridge could scare," by Ashley Halsey III, documenting how many drivers have long been scared of driving across that bridge. Then I continue with the article to page 4 of the hardcopy Post, where there was another article entitled "How to flee a car that's underwater," written by Julie Zauzmer, where I guess I learn how to survive in the extremely unlikely event that my car is pushed over a bridge, I stay conscious upon hitting the water, and then land in shallow enough water to actually swim to the surface. (Perhaps I'm more likely to accidentally drive into my neighbor's pool.) And perhaps we'll be hearing more about the Chesapeake Bay Bridge accident, as Ms. Halsey documents how AAA has asked federal experts to assess whether the barriers on that bridge are high enough. Yes, the Bay Bridge is very scary. There's a reason we haven't honored this bridge with a bridge drive--it's simply above our scale of scary. I can't say that all the coverage has helped make it less scary, although I don't actually make a connection between a freak accident and scariness. 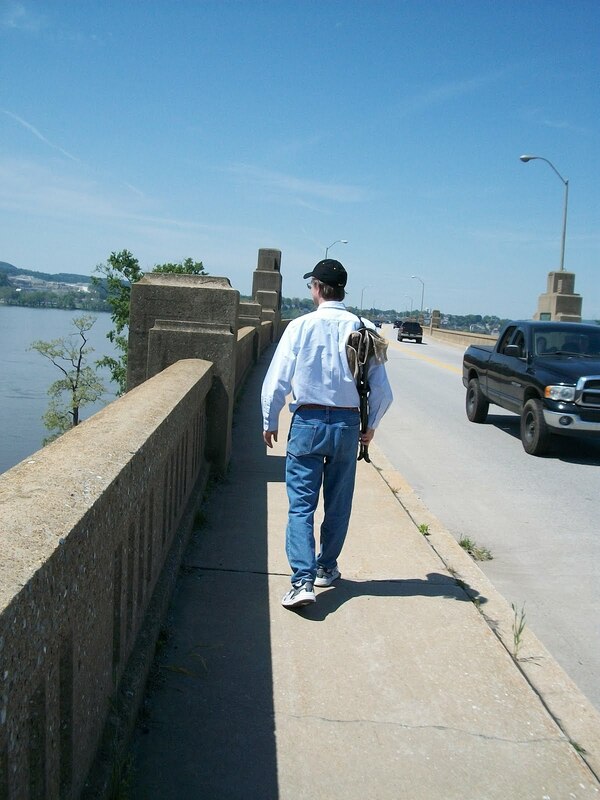 It is time to expand bridge treks to include those done by driving, not just by walking. There are limits to the number of major bridges that one can walk across, but there are lots of bridges, for good or for bad, that allow automobiles only. I will concede that, if you're going to build bridges, then transporting vehicles should be their main purpose, so we won't exclude the vehicle-only bridges from bridge treks. And even though I've said that if one can walk across a bridge, then one can drive across it, I will also say that it is possible to drive across major bridges without walking first. At least that's the plan. Our first driving-only bridge trek, done a couple of days before Christmas, was the Casciano Memorial Bridge. No one really knows it by that name, but rather as the Newark Bay Bridge or, like reading it off the map, the I-78 New Jersey Turnpike Extension Bridge. Now I'm sure you know where we are: in New Jersey. 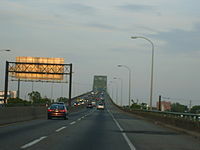 The bridge connects the cities of Newark and Bayonne on Interstate 78, and yes it does go over Newark Bay and is a major link between the Holland Tunnel (to New York City ) and northern New Jersey. If you are going from northern New Jersey to Liberty Park in Jersey City, where you can get the ferry to the Statue of Liberty, or into lower Manhattan via the Holland Tunnel, this is your bridge. 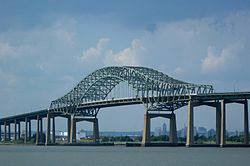 I took no photos of the Newark Bay Bridge, but wiki provides a couple (shown above). The scariness of this bridge was mainly an issue of having big barriers right up against the lane, requiring focus, rather than the height. I will say, though, the bridge did seem to go on and on, and the climb up was noticeable. Ah, the joys of driving over bridges. It's always something. I will give it a scariness rating of 12 based on its vertical climb and very narrow lanes, as well as its significant length. Well, we certainly didn’t start our bridge walking treks with the Golden Gate Bridge (GGB), but now we can add it to the list. It was the GGB that, during a visit to San Francisco three years ago, inspired me to start the bridge walking treks in order to deal with their inherent scariness,and indeed a photo that I took of that bridge has been at the top of this site since the very beginning, 2-1/2 years and some 20 or so bridge walks ago. The appointed bridge walking hour was a somewhat foggy October morning, temperature in the low 60s, relatively calm winds,and thus a perfectly fine day to walk the GGB. 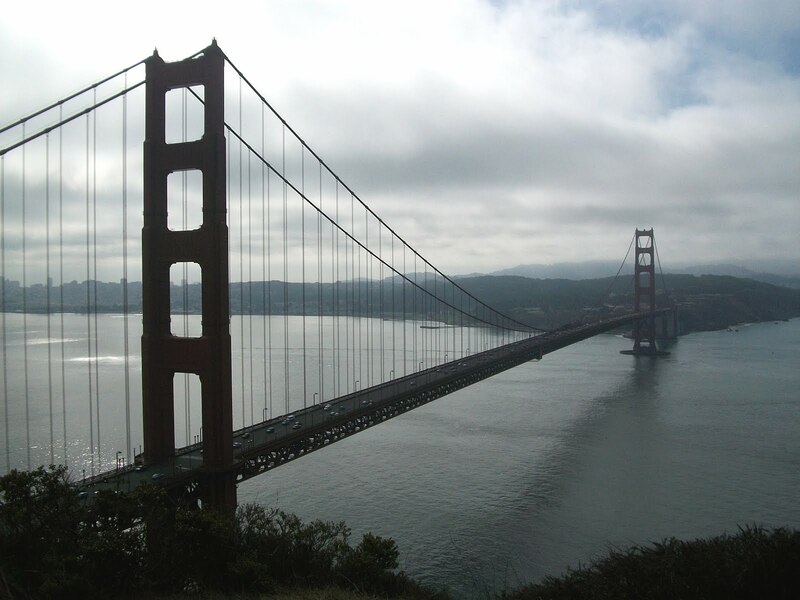 The bridge, which opened in 1937, is some 220 feet above the water, and is a rather long 1.7 miles in length, longer than any of our previous bridge treks, which have topped out at about a mile long.The Golden Gate Bridge is, of course, the icon of picturesque bridges. And that’s viewed from a distance. As far as walking across it is concerned, its height, length, and very open railings made it an exhilarating walk, albeit rather scary, at least early on. We started from the north vista point, just on the Marin County side,and walked back toward San Francisco. 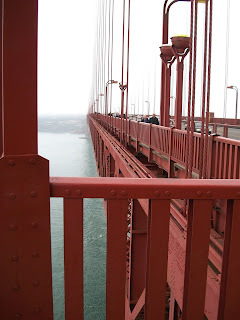 As my very supportive wife, who has walked across bridge after bridge with me,tells the story, she could barely keep up with my walking at the beginning of the Golden Gate Bridge, as I think I just wanted to get across as quickly as possible. Given that I haven’t actually run or jogged since the Bush Administration (that’s the George Herbert Walker Bush Administration), and given how many parts of my body hurt the day after (and how much), I suspect I came as close to a bridge run as I’m going to come. But we took lots of breaks, and I mean lots of breaks.I eventually calmed down and started to accept the height, took more breaks, eventually touched the side rails about two-thirds of the way across, successfully took the picture of a group of tourists who asked me (go figure), and 55 minutes after starting, we crossed the bridge, where the hop-on, hop-off bus awaited us(having stops on both sides). The walk was on the Sunday past, and then a few days later, to try to confirm my view from the very beginning that if you can walk across a bridge, then you can certainly drive across it, I did rent a car (first checking the fine print for a fear of bridges restriction) and drove it across the bridge and back. Yes, they do make you pay a toll for the privilege (heading into SF), which still seems a bit strange to me, but I could more or less comfortably drive across it. And I recommend the spectacular views of the bridge from the relatively unknown Battery Spencer just above and to the northwest of the bridge in the Marin Headlands. As far as the scariness rating for walking across the bridge is concerned, the Golden Gate Bridge certainly tops all that we’ve experienced. Using the height, length, and width standard, this one garners a combined 29, with a 9 for height (on a 1-10 scale, with each 25 feet getting a point), a 13 for length (blowing out the 1-10 scale that was calibrated for a mile long bridge being the highest, with diminishing amounts above a mile I guess), and a 7 for its width (relatively low, open railings). The wind was relatively calm, but I think relatively is the key word, so I suppose I could adjust up the scariness rating, but I won’t: this bridge doesn’t need it. More bridge walks in the future? Sure, why not? It's time to take a walk across a bridge spanning the Anacostia River in Washington D.C, the Frederick Douglass Memorial Bridge, built in 1949 and named after the former slave who became a statesman and leader of the abolitionist movement before the Civil War--and who also lived in the DC neighborhood of Anacostia after the Civil War. Yesterday morning in DC, a Saturday, the heat (88 degrees at trek-time) and humidity (typically high) were tolerable enough for a quick walk. The Douglass Bridge is short, about a quarter of a mile long, and is located right next to the Washington Nationals ballpark on the one side and at the edge of Anacostia on the other; it carries South Capitol Street over the river. The bridge itself is in a poor state of repair, and there are plans in the earliest stages for demolishing the bridge and replacing it as a part of the revitalization of the area surrounding the ballpark. The architects who proposed several possible replacements pretty much summed up the walking experience: "The bridge is primarily a vehicular crossing and discourages pedestrians and bicyclists." We parked near the Stadium on P Street, in one of just a few legal parking spaces in the area (which would probably have become inaccessible once the Nats game started that evening). We walked the short distance to the bridge and found very narrow sidewalks, but nice solid rails that extend up almost to shoulder height, which we always appreciate. Strangely, there were little sections underneath the railings that were open and got a bit big at points, but there was no possible slipping through, I'm glad to report. We encountered just one other person on the bridge, a bicyclist, fortunately when we were at a little cutout in the middle (for sightseeing, I guess). Otherwise, it would be a tight fit for a bike and a person. It's also a drawbridge, though I don't think it goes up very often. Despite the unlikelihood of a bridge raising, we were ready to beat it out of the middle of the bridge at a moment's notice if necessary. At its highest, the bridge is a reported 62 feet above the mean water level, apparently not enough to avoid the need for a drawbridge. There isn't all that much going on at either side of the bridge, unless a ballgame is going on, and the vistas off the bridge aren't exactly great, though it is always great looking at a ballpark. So, I don't know that I can recommend this walk it as a great experience-- but the bridge certainly gets the job done. Someday perhaps we'll have a more picturesque and pedestrian-friendly bridge at this location to report on. The Washington Post shows pictures of some of the alternative bridges that were proposed. As far as scariness ratings go, we give this one a 9 , the sum of a 3 for length, a 3 for height, and a 3 for its width (low because of the high railings, though a little bit of a scary rating because of the narrowness of the sidewalk and that open area under the rails). A nice Sunday in May was a great time to walk across the Columbia-Wrightsville Bridge, which spans the Susquehanna River in Pennsylvania and is the link between the two towns of Columbia and Wrightsville that are themselves located between the bigger towns of Lancaster and York. It's a low, 2-lane bridge, about a mile long, built in 1930, and not very busy thanks to the much newer Highway Route 30 Bridge that is just to the north. The Columbia-Wrightsville Bridge is officially named the Veteran's Memorial Bridge, but there are many with that name across the country, and it is more commonly known by the two towns that it connects. There have been multiple bridges at the same location over the past two centuries, with one of them playing a role in the Civil War when Union forces burned it in order to keep Confederate troops--a small part of Robert E. Lee's invasion of Pennsylvania that ended with Gettysburg--from crossing into Lancaster County and making a move toward Harrisburg 30 miles to the north (see blog post by Norman Gasbarro for a nice description of the battle and burning). But the current bridge isn't a good candidate for burning, being a concrete structure, with multiple arches; in fact when built, it was the world's longest multiple-arch concrete bridge, if you're into records for bridge subtypes. Except for its length, it seems like a small town bridge, with a 6-foot wide sidewalk that is separated from the roadway by just a little curb. With a speed limit of 40 miles per hour, that would normally not be a big problem for walkers, but let's face it, people don't really drive the speed limit, and the barrier on the water side of the bridge is just above waist level, not all that satisfying, providing the not great choice of walking very close to traffic or the edge. Fortunately the roadway itself is very wide for just 2 lanes, so the cars tend to stay toward the middle of the road and leave the walkers to admire the views off the bridge. Walking across the bridge, we got nice views of the Susquehanna River down to the south and the Route 30 Bridge to the north. A number of joggers were using the bridge. Just a nice, pleasant walk--except for the cars and the low side rails. We started from the Columbia side to the east, parking just a couple of blocks away from the bridge at the corner of North 2nd and Chestnut Streets. And after walking partway across the bridge and returning to the car, I drove the car across the bridge, with the theory of course being that if you can walk across a bridge, you can drive across it too. Strangely, when driving, you can't even see over the edge to water, because the side railings are solid and set just high enough to obstruct the views. That doesn't seem to be allowed with newer bridges, because people seem to want their bridges to afford majestic views, even though it seems that the drivers should be concentrating on driving; but maybe that's just me. So, this one was a nice bridge to walk across. As for the scariness rating, I'd give it a 5 for length, a 4 for the width (being close to the roadway and with moderately low, though solid side railings), and a 3 for height (I can't find a reference to its average height above water, so I go by what I see). That's a 12 rating overall, a bit on the higher side of average for our walks. Yesterday was a beautiful March Saturday in Washington, DC, perfect for a walk across a bridge, and we chose the Chain Bridge. This quarter-mile bridge crosses the Potomac River, connecting the far north parts of Arlington,Virginia with Washington, DC. It was the site of the very first bridge crossing the Potomac between DC and Virginia, a wooden covered bridge built around 1800. Time and floods have required several replacements over the years, including three chain suspension bridges in the first half of the 1800s from which the current one gets its name, and others built on stone piers in the mid 1800s that are still used for the current bridge, which was completed in 1939. Just north is Little Falls and, further up, Great Falls, areas with rapids popular with kayakers. The river remains rather rocky at Chain Bridge, and it is only recommended for small craft with knowledge of the narrow and shallow channel. 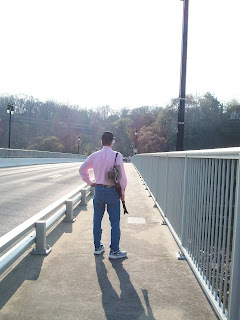 We could park on the DC side of the bridge, where there were a small number of parking spots on the Clara Barton Parkway. The ground slopes steeply down to the river. Some intrepid people trekked down there and were either fishing or just hanging out on the rocks. The area is relatively natural; for example, we could see a number of turtles on this 65 degree day sunning on the rocks and horizontal branches below. There are also steps down to the C&O Canal towpath, which is next to the Potomac River on the DC side of the bridge. The views from the bridge were of the natural scenic variety--no national monuments here. Lots of rocks below, lots of nature. The sidewalk on the bridge is moderately wide, with a side railing at about neck level for me, very safe for walking you'll be glad to know. The ground slopes quickly downward, so while the bridge is level, what starts out as just a few feet above the ground eventually becomes a bit of distance to the water below--I've seen it written that the bridge is 50 feet above the river. Of course, as with most pedestrian bridges on roadways, the cars are somewhat distracting. It is an urban bridge, so speeds aren't all that high, but nonetheless the cars are but a short railing away from the sidewalk. Nonetheless, the bridge is a nice addition our series of DC bridge walks, given the natural beauty of the area below. If you like that sort of thing, you should definitely head a little further north to the Falls, on either the DC or Virginia sides, where there are parks to hike and see the big falls and kayakers navigating them. As for the scariness of Chain Bridge, the cars seemed scarier than anything, in some cases speeding across the bridge, though the short railing provided needed protection. The steep drop-off of the bridge as it gets to the river does provide some excitement and certainly a nice view of the area. The bridge is very short, though, and the river part shorter yet. We'll give the bridge a scariness rating of 7, with a 1.5 for length, 2.5 for height, and 3 for width (the main issue being not enough distance from the cars, not our usual issue). That makes it one of the calmer walks we've undertaken. Following the previous walk over the George Washington Bridge, this was quite mellow.